I’m totally cheating with my answers. I can’t imagine using only three tools. What counts as a tool, anyway? Is the Internet a tool? What about the scientific method? Are we talking about apps, applications, platforms, systems, frameworks? =) Anyway, these are the answers that came to mind. They’re not your usual suspects, but I’ll explain why I like them a lot. Emacs: This arcane text editor from the 1970s is capable of far more than most people think it can. It’s not an application, it’s a platform. I use it to code, write, plan, connect, automate, calculate, and so on. People get intimidated by its learning curve, but for me, it’s well worth it. I’ve been learning and blogging about it for more than ten years. Based on what I’ve seen, I could probably keep going for decades. I love the way you can dig into how things work, tinker with the code to make it fit what you want, and combine different packages. Great user community, too. 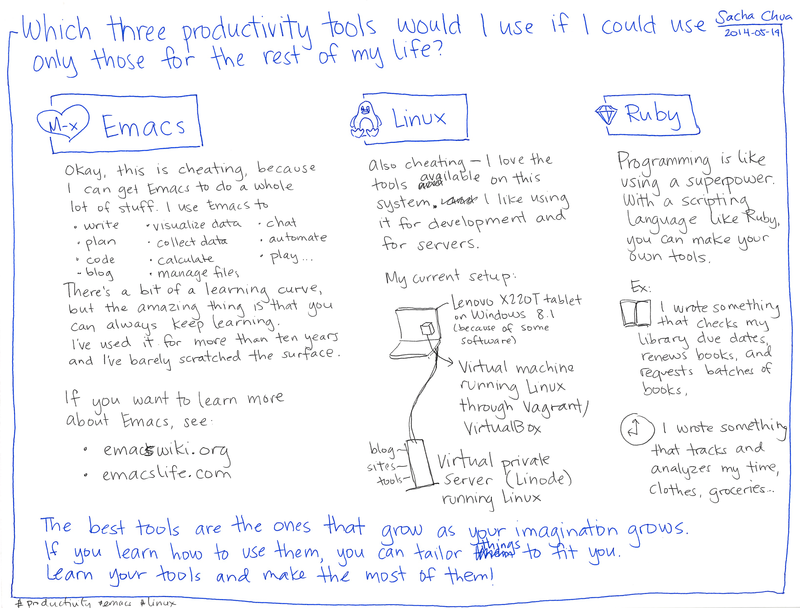 I’m not sure what to say to productivity newbies considering Emacs. It takes a certain kind of person, I think. If you’re someone who likes constantly learning and tweaking, you’re good at learning from what other people have written, and you’re not afraid to do a little worse in order to do even better in the future, this might be for you. You don’t have to be a programming geek, although it helps. Linux: Again, I’m cheating by including an entire operating system, and probably I mean all the little tools I’ve gotten used to rather than the operating system itself. But I love being able to use utilities like grep and find (thanks, GNU! ), stitching programs together, scripting things, installing other tools… People have suggested that I look into Mac OS X, but it gets a little on my nerves. I like Linux more. There are some programs I want to run on Windows, though, so I end up using Linux in a virtual machine so that I can do my development in a proper environment. Ruby: I use Ruby for little automated scripts as well as special-purpose web-based tools like QuantifiedAwesome.com, which helps me track my time. It feels like the way my mind works. I used to use Perl for scripting and I’m learning Python, but Ruby has the least friction for me. This may change as I get deeper into other languages, but in the meantime, Ruby is a good language for the kinds of things I want to do. All of these tools take effort to learn. They’re not like, say, Boomerang for Gmail or ScheduleOnce, which are easy to pick up and have clear benefits. My favourite tools require imagination, but they open up infinite possibilities. I’m not locked into one way of doing things. I still have limits, but they’re the limits of my own ideas and skills. I think that’s what I like about these tools. They have depth. Whenever I reach for some new capability, I almost always find it. So, if you’re a newbie and this sounds intriguing, how do you get from point A to point B? I think I got here by being interested in learning, being unafraid of tinkering, and having the space to do both. When you’re learning a complex thing, you might feel frustrated and intimidated by it. Good games design that learning experience so that people enjoy small wins as they develop their skills, but not all topics are like that. Sometimes you have to enjoy the learning for its own sake. … which is an odd message to share with people who are looking for productivity hacks, maybe, but it’s something I’ve been thinking about lately. There’s a cost to picking general-purpose tools that are perhaps not the best at one specific thing, but experience results in compounding benefits. There’s a cost to keeping both your schedule and your eyes open, but perhaps it can lead to surprising things. There’s a cost to choosing the path of learning rather than the quick fix, but who knows what the true cost is down the road?